The Step-Down Power Supply can be used to power a stack of Bricks and Bricklets. 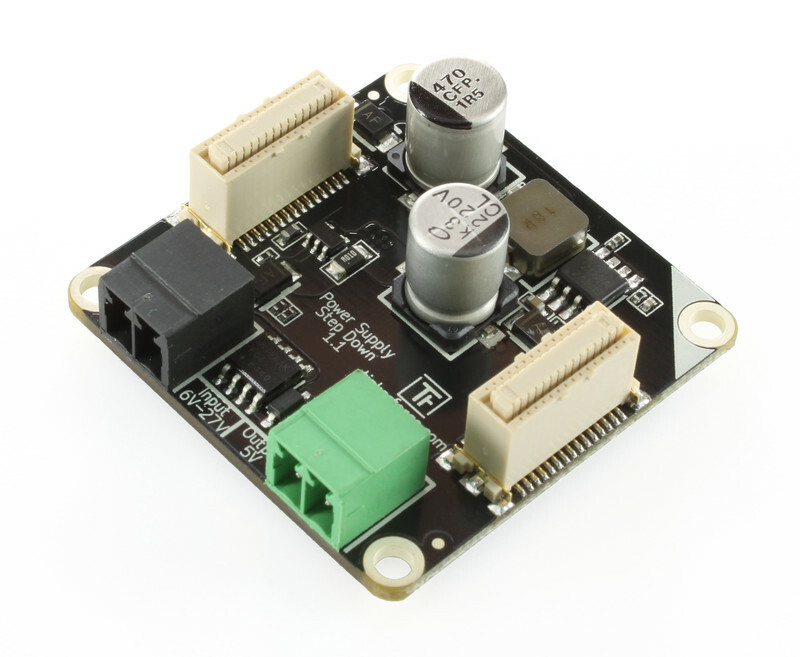 It is equipped with an efficient step-down controller and can be plugged in at the bottom of the stack where it provides the 5V needed for Bricks and Bricklets. 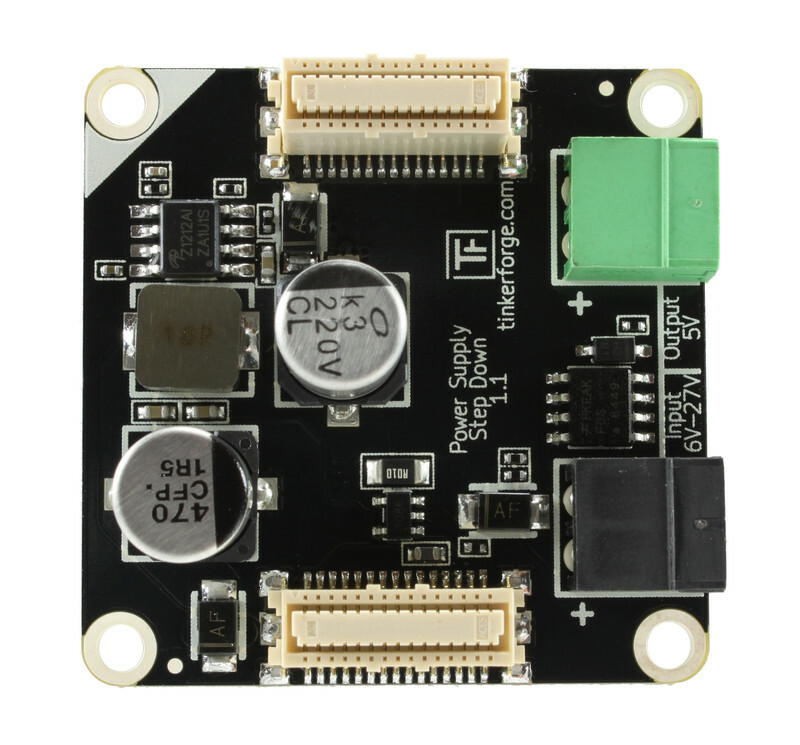 In addition it feeds the external voltage into the stack power signals. It is not absolutely necessary if you only want to use a single Brick. But is intended to be used with stacks. There are several possible applications. 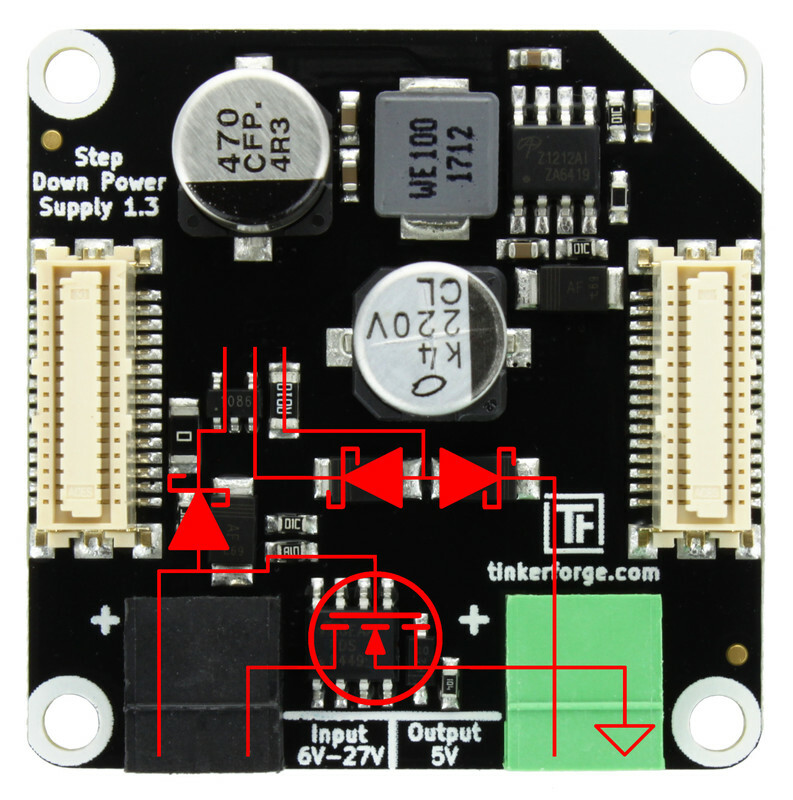 The Step-Down Power Supply allows to create stacks powered by batteries. These stacks can then communicate cable based or wireless with the help of Master Extensions. 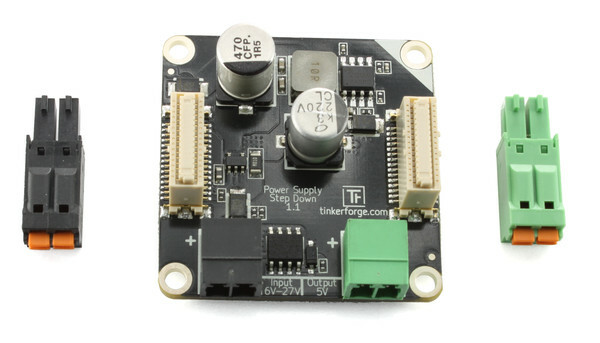 Also, the Step-Down Power Supply can be used to power DC motors, servos or stepper motors (over the stack power signals with up to 27V DC) without the need to connect external power sources to the corresponding Bricks. 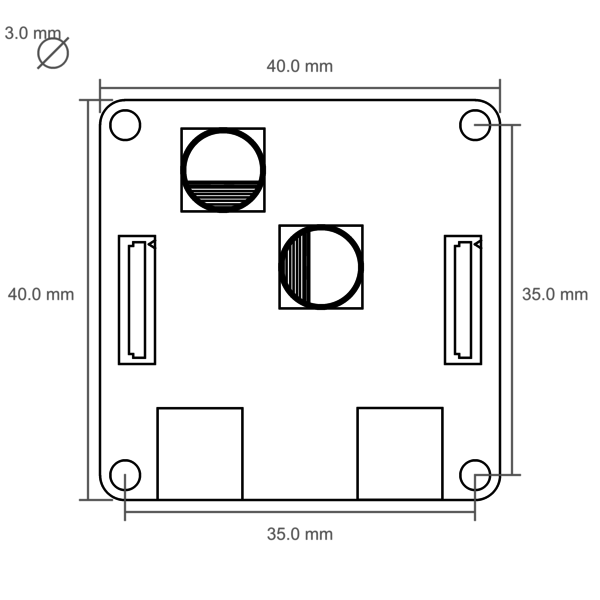 It is also possible to use the Step-Down Power Supply in cases where huge stacks of Bricks with many Bricklets are needed and the maximum current of 500mA given over the USB port is not sufficient. 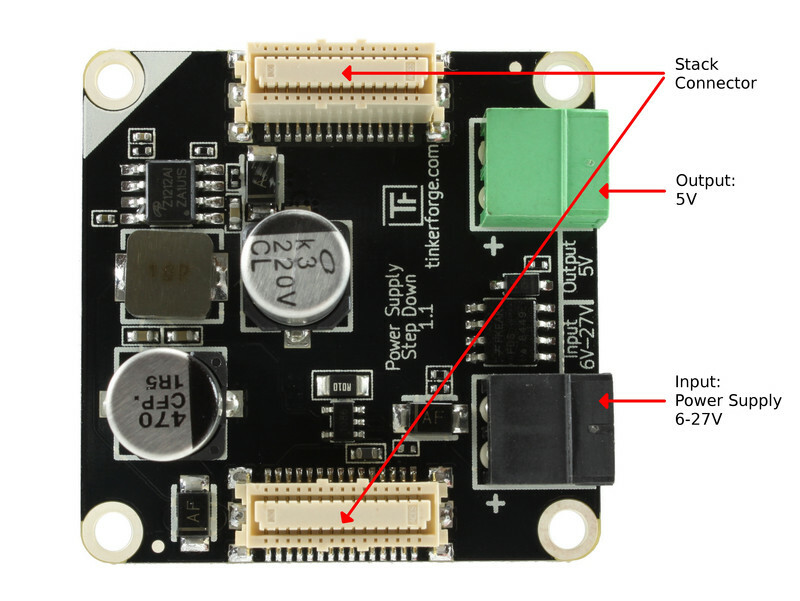 The possible input voltage range is 6V to 27V DC. A Master Brick can measure the current consumption of the stack and the voltage of the external power source. Currents below 200mA can not be measured satisfactorily. Starting with hardware version 1.3 the Step-Down Power Supply is reverse polarity protected on both connectors, as well as protected against an accidental "connector swap". The following picture depicts the different connection possibilities of the Step-Down Power Supply.